There are certain shirt numbers in some football teams that are iconic. The number 10 for Brazil and Argentina evokes memories of Pele and Maradona, or Neymar and Messi. Similarly, at club level, the equally great rivals of Liverpool and Manchester United both have the number seven shirt as their most iconic. For the Anfield side, it was Kenny Dalglish and Kevin Keegan, Steve McManaman and John Aldridge, and most recently filled to its historic weight by Luis Suarez. Thirty miles away at Old Trafford the lineage goes from George Best, the game's first superstar, through to Bryan Robson, Eric Cantona, David Beckham and Cristiano Ronaldo. The first and last of those wore the shirt when they won the Ballon d'Or. That's a lot for those that followed to live up to but where Ronaldo's immense neck and shoulders could bear that burden, no one has since. Ronaldo was 23 when he won that first Ballon d'Or. He said at the time that the best was yet to come and he was right. Sadly for the red half of Manchester it was not to be wearing their number seven shirt. It will be a decade this summer since Ronaldo left Manchester for Madrid. Despite the longing by some of the Manchester United faithful to see him return to the club, his move last summer to Juventus is likely to be his last and the chances of seeing him in a red shirt again have gone with it. So what of those who have followed? The current incumbent, Alexis Sanchez, may have played his last game of the season after injuring his knee in the club's English Premier League meeting with Southampton at Old Trafford last week. His absence will not be felt. Sanchez, the club's highest earner on a reported 391,000 pounds per week plus a 75,000 pound appearance fee. Since he arrived at the club in January last year he has played 44 times and scored three goals. There is a chance given the new manager to be appointed at Old Trafford, and if a suitor can be found to accommodate his wage demands that he has played his last game for the club. 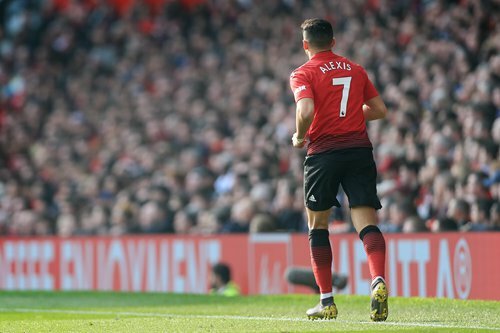 But the misfiring Chilean, who looks a different player in his country's colors, is not the only one to have failed to live up to the expectation that comes with sporting the number seven on your back at Old Trafford. The first player to wear the shirt post-­Ronaldo was Michael Owen. Once one of the finest strikers in world football and a winner of the Ballon d'Or himself in 2001, it is safe to say that the former Liverpool man was not at his peak when Alex Ferguson signed him. Owen arrived from Newcastle United on a free transfer in the summer of 2009 and played 52 times for Manchester United. His first goal at Old Trafford was a stoppage-time winner in front of the Stretford End in a Manchester derby that ended 4-3, and he also scored the opener in the League Cup final in which United beat Aston Villa. He also picked up his first Premier League winners medal the following season but those were the highs of a three-year career that saw just 15 more goals before he went to Stoke City. He was an unused substitute in the 2011 Champions League final defeat to Barcelona at Wembley and his final season finished trophyless. Despite the relatively low bar, Owen remains the most distinguished of all of the post-Ronaldo number sevens. He wore the shirt for the longest period of time and also scored the most goals in it. Antonio Valencia was brought in from Wigan Athletic in the same summer as Owen and the Ecuadorian right winger was seen as replacement for Ronaldo. Once Owen left he took the vacant squad number for the 2012-13 season. Valencia struggled under the pressure and handed it back at the end of the campaign. While United won the Premier League, Valencia had struggled for form. He remains at the club, with interim manager Ole Gunnar Solskjaer his fifth boss during his decade at the club. The Norwegian will be his last after announcing that the club has decided against offering the 33-year-old a new deal. He played 40 times in the number seven shirt and scored once. The shirt remained unused for the next ­season, the first of the post-Ferguson era, before the arrival of Angel di Maria under Louis Van Gaal the following summer. His signing was met with much fanfare, this was an Argentina international who had been short-listed for the Golden Ball, award for best player at the World Cup that summer and had inspired Real Madrid to Champions League success. He did not hit those heights in his brief spell in Manchester. He played 32 times and scored four goals, one of which was a sublime chip over Kasper Schmeichel away at Leicester City, but a burglary at his home meant he wanted away from a team that failed to get the best out of him under the Dutchman. He moved to Paris Saint-Germain and has returned to form, notably in this season's first leg of the Champions League round of 16 at Old Trafford where he inspired a 2-0 victory over his former club. Di Maria remains United's third most expensive signing in their history. The final man to be bestowed the shirt before Sanchez was Memphis Depay. The Dutch winger arrived from PSV Eindhoven in the summer of 2015 having topscored in the Eredivisie as his team won the title. He struggled to adapt to the pace of the Premier League, looking more comfortable in the club's Europa League matches, and scored seven times in 45 games in his first season. He was not involved in the team's FA Cup final win over Crystal Palace and lasted just half a season under Jose Mourinho after he replaced Van Gaal, playing eight goalless games. Depay has kicked on since joining Lyon in January 2017 but even with a buyback in place it is unlikely he will see success in the number seven shirt. The question is who will?